What is a Drawer or Pop-up cart? It is any pop-up mechanism that shows the content of the cart while on the product page and allows visitors to update the cart and check out. Discount Ninja detects Drawer carts and ensures that visitors who check out through the cart will receive the correct discount. Drawer carts do not display the dynamically updated price of the products. 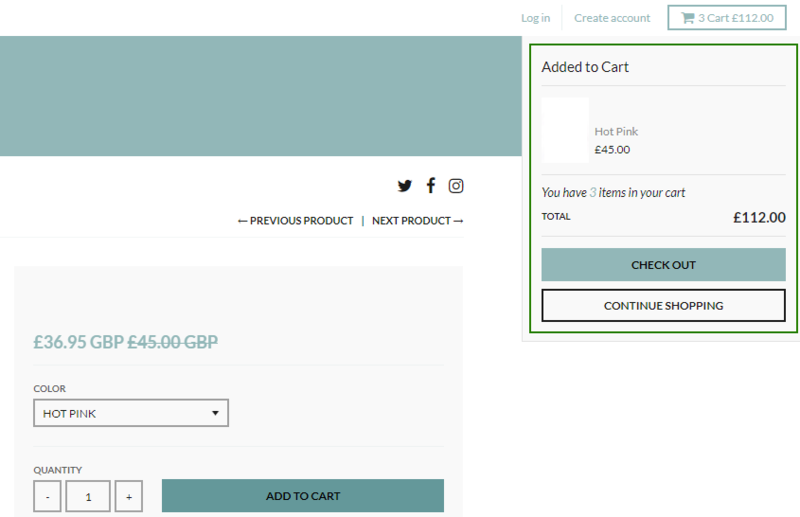 In the example the selected product is discounted to 36.95 GBP whereas the drawer cart shows the original price (45.00 GBP). How can I disable my Drawer / Popup cart? Go to Online Store > Themes and click the "Customize" button. In the available settings find your Cart settings and locate the option that allows you to set the cart type to the normal cart page. The location and availability of this setting depends on your theme. If you cannot find the option ask your theme developer how to disable the popup cart.